This was just to see how this new J Herbin ink would work for type and illustration and as you can see, it’s wonderful. This was created using a Noodlers Ahab flex pen on a heavy cartridge paper. The solid characters were filled in using a fine no.2 brush. 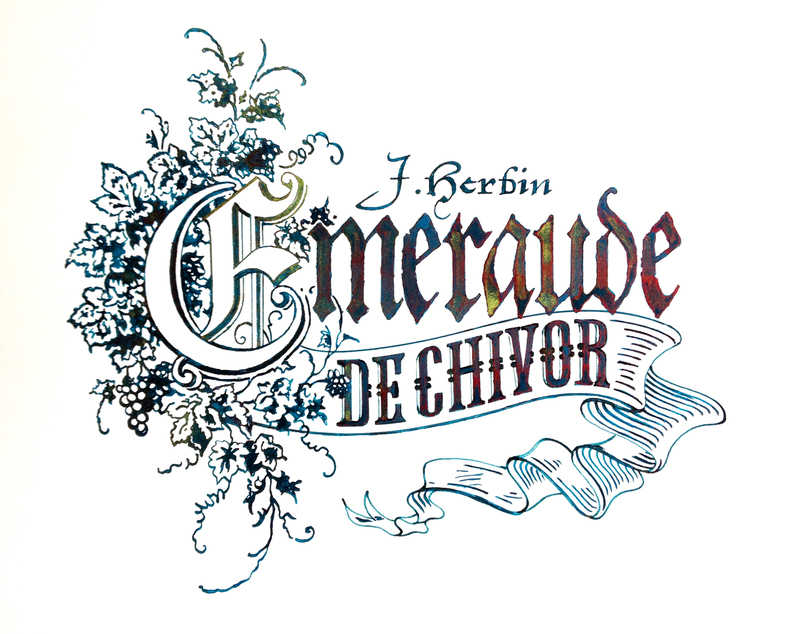 Bottle of Emeraude de Chivor supplied by Kevin Wharton at Exaclair Limited. I really need to purchase another bottle of this color. Everyone raves about its sheen and sparkle, and we get none of that, no matter which pens and papers we use. I wonder if we got a bottle at the end of a certain ink run? I am terribly disappointed with ours, and yet this artwork shows just how gorgeous it CAN be. Firstly, you need to really shake the bottles before use so that you get a good even consistency in the nib. The examples I have posted have been treated with 10mm wide automatic pen and then photographed with perfectly positioned lighting to show the gold and magenta sheen. When used with a fountain pen for writing, viewed head on, it will appear green but viewed from different angles in strong light, the magic will reveal itself. Oh, I know about shaking the bottle, believe me! My wrist gets sore from shaking the 4 bottles of 1670 inks we own (all 4, and waiting for the new Carob color to be available)! LOL! I usually use Tomoe River paper in white to write on, and either wide fountain pens or dip pens, Q-tips, or brushes. When we put the ink on TR paper in a big blob and let it take a day or so to dry, I can see the sheen, but STILL not the sparkle. But in everyday writing/drawing applications, I see nada. I guess I need to check my lighting and viewing angles. Thanks for the suggestions :-). I had read somewhere that they had discontinued the gold sheen from the red Hematite Rouge. Not sure if that is true, but the article said people were complaining about how their pens were having a lot of ink crud. I had that problem with H.R., so that’s why I did not E. of C. I love the colour, but I don’t want any nib creep, crud, gunk, etc.